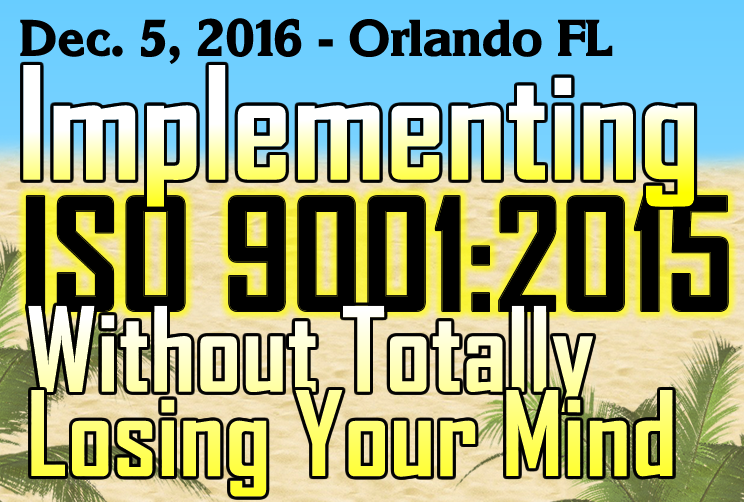 Oxebridge founder and VP Christopher Paris will present a full day “Braindump Course” on implementation of ISO 9001:2015 in Orlando Florida on December 5th, 2016. Full details can be found here. The 8-hour course “Implementing ISO 9001:2015 Without Totally Losing Your Mind” will take attendees through the entire ISO 9001:2015 standard, giving practical and proven methods for implementation for both manufacturing firms and service providers. The implementation advice given is based on actual experience Mr. Paris has obtained through implementation of the new standard with clients who subsequently were certified by independent registrars; the advice is not theoretical, but proven. The Secret Origin of Annex SL – how it came about, and why ISO hopes you won’t take this course. COTO & RBT – implementing the new “Context of the Organization” and “Risk-Based Thinking” requirements in the right sequence, without driving yourself mad or spending a fortune. The Clauses that ISO 9001 Forgot – important aspects a QMS should have, but which TC 176 forgot to put into ISO 9001:2015. Measuring Customer Satisfaction Without Those Damn Surveys – gobbling up data without harassing your customers. The Process Approach Made Freakin’ Easy – how to implement the process approach so you get real and lasting value. Six Sense Auditing – conducting audits using all six — yes, six! — senses. Dominate Your Registrar! – turn your third party auditor into your willing zombie slave, just by overwhelming them with your awesomeness. The event will be held at Challenger Parkway, Orlando Florida, just 30 minutes from Orlando International Airport, and minutes to Walt Disney World theme parks and resorts. The fee for attending is $450 and includes lunch, beverages and a free copy of Mr Paris’ new e-book, Surviving ISO 9001:205 – What Went So Terribly Wrong With the World’s Foremost Quality Management Standard, and How to Implement It Anyway. The event starts at 9:00 AM and lasts until 5:00 PM. For more details and registration, click here. Seating is limited, and Mr. Paris’ events tend to sell out quickly.